Apple's iPhones have been compared to Samsung flagships for a long time, and there's usually a lot of talk around camera quality. 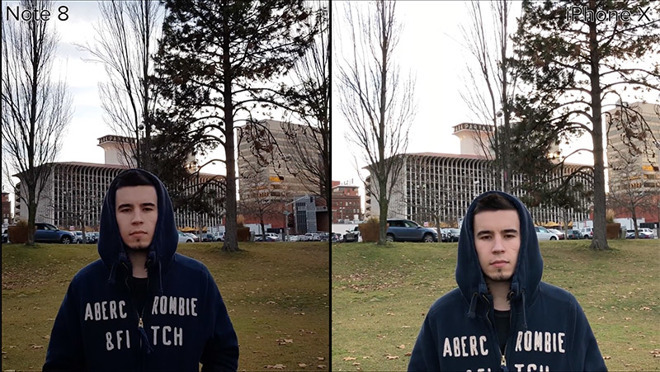 We already compared the quality of still photos between the iPhone X and Galaxy Note 8, so let's take a look at video. Although both phones can record 4K video, the iPhone X can record 4K at 60 frames per second, twice as fast as the Note 8, making for very smooth videos. This is all thanks to the HEVC video format that Apple introduced with iOS 11. The iPhone X can also record 1080p slow-mo video at a shocking 240 frames per second, whereas the Note 8 can only record 1080p at a maximum of 60 frames per second. You'll have to bump down to 720p to be able to record 240 fps slow-mo on the Note 8. However, the front-facing camera on the Note features an 8-megapixel sensor compared to 7-megapixel unit on the iPhone X. That translates to video recording at 1440p on the Note 8 compared to 1080p on the iPhone X. 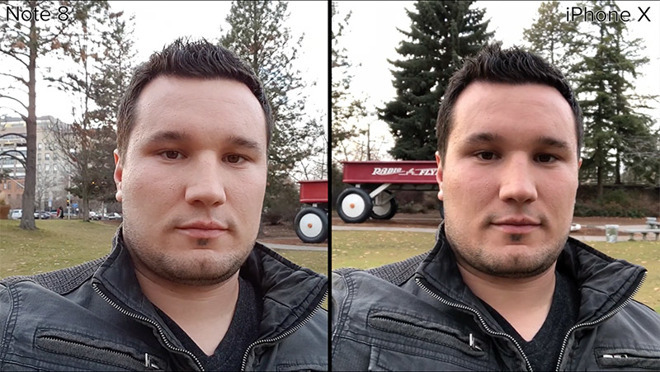 Let's start the comparison with the front facing camera, the iPhone x has more detail, despite recording in lower resolution. 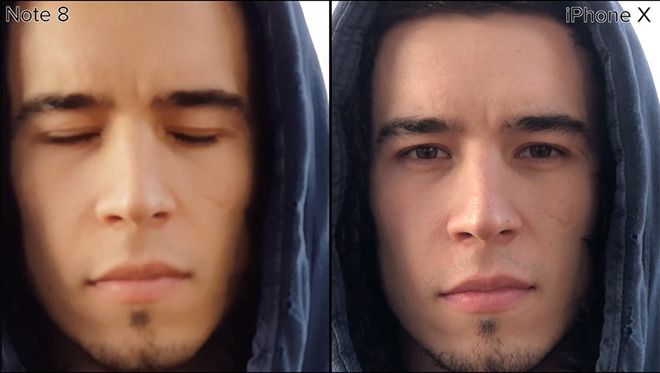 The colors and highlight roll off is more natural, while the Note 8 brightens up the shadows underneath the eyes, which looks better. Switching to 4K on the rear-facing camera, the iPhone is properly exposing the subject and shows more detail, visible on the street signs and facial hair. Here, the Note 8 is also underexposing, which provides for a more pleasing image. The iPhone could use some more contrast, but the exposure is more true to life. Even though the iPhone X has a brighter exposure, it's still retaining more highlight detail in the clouds. The Note 8's optical image stabilization does a better job for walking, but this time the image is overexposed. 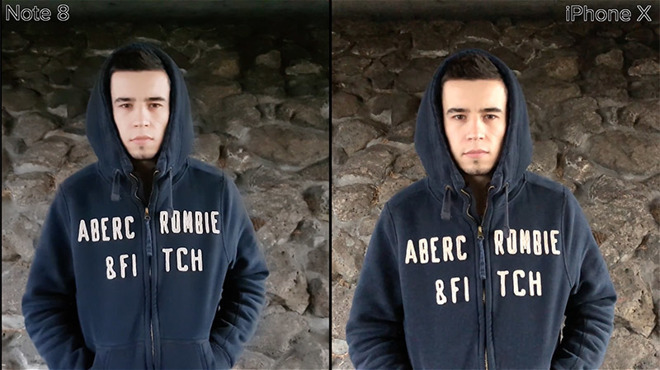 Even though the stabilization is smoother, the Note consistently back-focused, or focused on objects behind the intended subject. After repeated autofocus tests, the iPhone did a much better job with autofocus tracking, especially for close-ups. The Note 8 not only takes longer to focus, but also suffers from focus hunting, while the iPhone focuses almost instantly. Taking a look at lowlight, the Note is aggressively de-noising, providing a more pleasing, but much less detailed image. Using the telephoto lens, the Note 8 has less noise, more detail, and better colors, beating the iPhone X in every way. The iPhone's 4K 60 recording provides for smoother video, especially if you're going to slow it down. As you can see, the Note's 4K is unusable for slow motion because of the choppiness. If you want smoother slow motion on the Note 8, you can also shoot at 60 frames per second, but you're limited to 1080p, which means overall quality takes a hit. 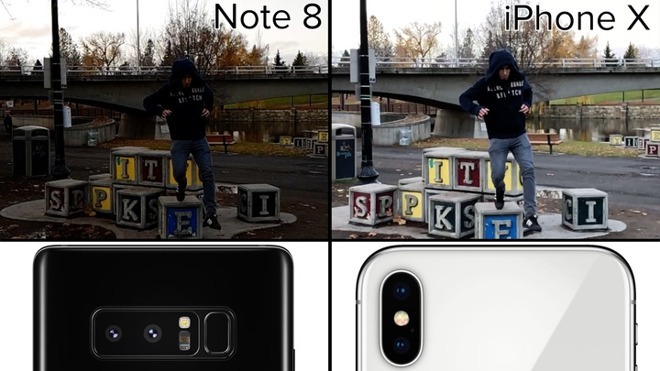 The iPhone X can shoot super-slow motion at 240 frames per second at 1080p, whereas the Note 8 can only do it at 720p. Overall, the Note 8's image had less detail, a lot more artifacts, and was consistently underexposed. The Note 8 did take the lead in a few categories like low light and stabilization, but overall the iPhone X is definitely ahead with much faster and more accurate autofocus, more true to life colors and contrast, and in general more detailed video. It also the shoots much better super slow motion and is the only phone to support 4K at 60 frames per second, making it the a solid choice for mobile videographers.